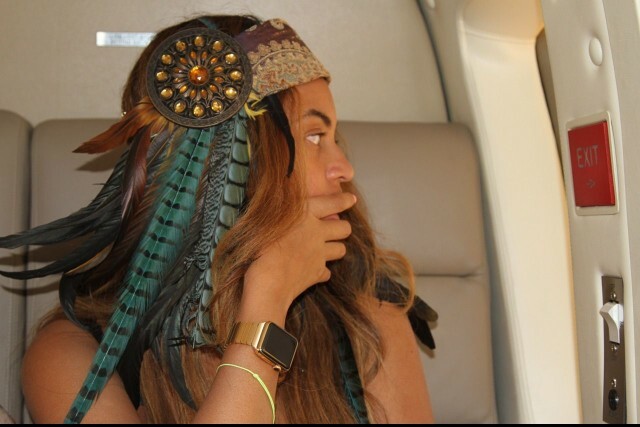 The latest celebrity to flaunt an Apple Watch is none other than Queen B herself. Today Beyonce posted photos of herself at Coachella wearing the 18-karat Apple Watch Edition and a custom band you can’t buy. One of iTunes’ most beloved artists has a solid gold link bracelet for the Watch that Apple doesn’t sell officially. And it probably costs more than the Edition itself. Fashion designer Karl Lagerfeld was photographed with the same Watch/band combo last week. The most expensive Apple Watch you can buy in an Apple Store costs $17,000 with a leather band and solid gold buckle. Apple’s steel link bracelet is already its most expensive brand at nearly $500, so a solid gold model has to be insanely expensive. Beyonce joins a list of A-listers like Pharrell, Katy Perry, Drake and Sam Smith who were all given an Apple Watch before its April 24th release. Jony Ive debuted a bunch of custom Apple Watch band colors in Milan last week, so it looks like Apple will continue outfitting celebrities with exclusive band configurations for the foreseeable future. This entry was posted in Apple news and tagged Apple Watch, Beyonce. Bookmark the permalink. Can you actually use the new 12-inch MacBook for work?